Where will the retreats be held? The retreats are hand selected in advance by Melissa to ensure the accommodations feel just as inspirational as the rest of the trip. As the retreats are smaller and more intimate, each location will have between 7-14 participants. 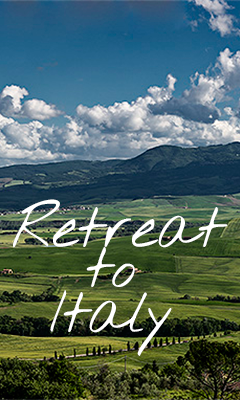 Currently, our retreats are scheduled for Italy, Mexico, and Argentina. What is the age group for the yoga retrat? The ages vary with some participants in their twenties but it is predominantly between late 30s and early 60s. Check each individual retreat to determine what is included. In general, the trip is relatively worry free in terms of expenses with the exception of a few meals on your own, airfare, incidentals, and any individual shopping. I am traveling alone, is that okay? We love solo travelers! Some people travel with a friend or family member while others travel alone. We eat many meals together so you will get to meet other retreat participants and make new friends. We will pair you with another solo traveler for shared accommodations. I am not that experienced with yoga or the creative outlet as indicated on the retreat, can I still attend? Yes! Most of our retreat participants have limited to no experience with both the yoga and creative outlet. The main goal of our retreats is to find inspiration. Our instructors are well versed and can assist the most beginner or advanced practitioners. To register, place your individual deposit on the retreat pages. After we receive your deposit, we will invoice you for your remaining balance as it becomes due. After you register, you will receive an email confirmation and be asked to join our mailing list for the retreats. We use this list to send informational emails regarding your upcoming trip. The price of the retreat includes your shuttle pick up from the nearest airport. This is already included in the cost and you will receive your designated time frame for pick up. You can choose to make your way to and from the retreat at your own expense. I want to add on to my trip, can you help with that? We can help with recommendations from our experience and will include topics in our newsletter but for in depth questions we will refer you to a travel agent. We do suggest adding on to your trip on the front end, as traveling can be stressful and we incorporate time to relax.